“Beat Camp”, a weekend seminar for aspiring music producers, recording artists, and audio engineers, will be presented at SAE Institute Atlanta from Friday, June 6, through Sunday, June 8. “Beat Camp”, a weekend seminar for aspiring music producers, recording artists, and audio engineers, will be presented at SAE Institute Atlanta from Friday, June 6 through Sunday, June 8. Attendance at ‘Beat Camp’ is a first-step for aspiring music business pros who want to turbocharge their careers. It will allow anyone who’s serious about working in today’s music industry to make huge strides in their professional journeys. “Beat Camp” is a partnership between SAE Institute and iStandard Producers, an organization that creates networking and collaboration opportunities for professional music producers. 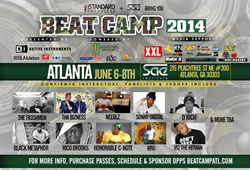 “Beat Camp” sponsors include Ableton, Monster Energy Drink, XXL Magazine, and Native Instruments. “Beat Camp” will feature classroom discussions on producer branding, management, A&R meeting simulations, studio techniques, networking/brand building strategies, songwriter-producer synergy, sampling, and live mixing sessions. Each seminar will be led by top industry professionals with major credits and experience, including stars such as The Fr3shmen, Tha Bizness, Black Metaphor, Rico Brooks, Needlz, Honorable C-Note, Sonny Digital, M16, D Rich, V12 The Hitman, and more. Evening “Beat Camp” activities will include the iStandard Producer Showcase, Celebrity Beat Cyphers, and Impromptu Beat Battles. There will also be vendor demos, raffles, and other special events throughout the weekend. iStandard Beat Camp will be held at SAE Institute’s Atlanta campus, located at 215 Peachtree Street, NE #300. The two-day event will begin on Friday, June 6, and run through Sunday, June 8. For more information, visit the Beat Camp ATL website or contact SAE Institute Atlanta at (404) 526-9366.